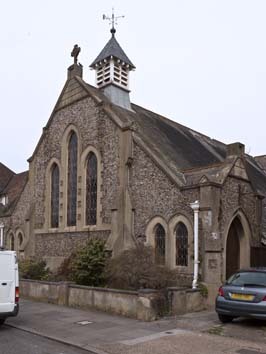 Built in 1900 to a design by J B Wall (Elleray (2004) p3), of knobbly flint with large cement-faced lancets, including triplet above the altar, and a small wooden louvred bellcote. To one side is a large entrance and the general appearance is curiously old fashioned for the date. Inside, it has aisles, separated by iron piers and a short chancel. The roofs inside are all panelled. The church was closed for worship in December 2011 and its future is uncertain. A proposal for 10 flats on the site (see Bexhill-On-Sea Observer 29 August 2014), retaining only the front, was withdrawn, as was a further similar application in 2017 (The Argus 13 March 2017).